In Part II, we moved beyond LDL-C into total and small LDL-P and their differences in the findings. Small LDL-P appeared to correlate closely with LDL-P but at a higher gain to loss ratio. Thus, we need to have at least one experiment to have a lopsided ratio of one against the other relative to the ketogenic ratios. 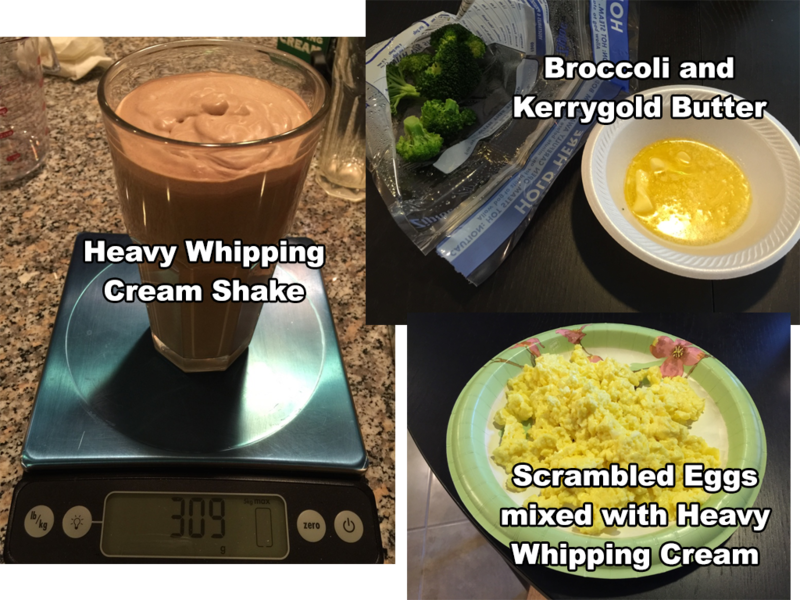 Me being me, I decided to do two tests: one with a Super High Fat (SHF) ratio 95% fat / 4% protein / 1% net carbs for three days, and one with a Super High Protein (SHP) ratio 50% fat / 45% protein / 3% net carbs for three days. 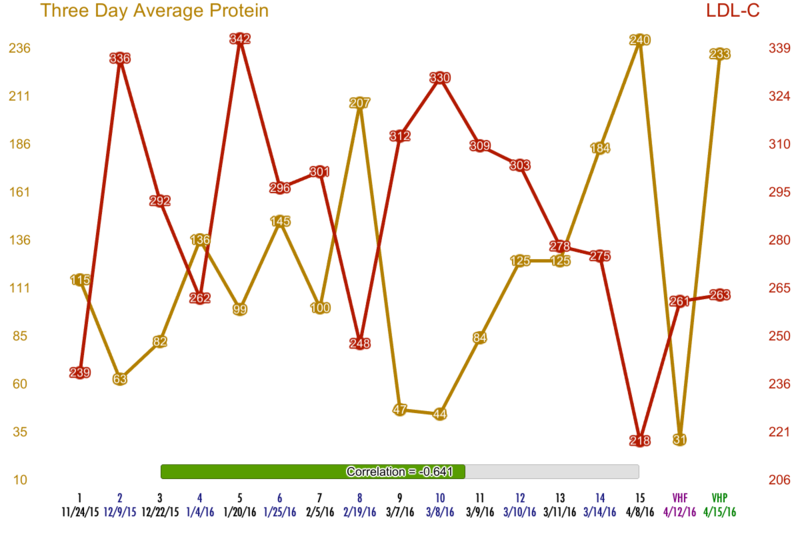 And finally, I added a third test in the following four days at closer to my usual ketogenic ratio with 75% fat / 21% protein / 4% net carbs to see if my numbers snapped back into the original correlation. 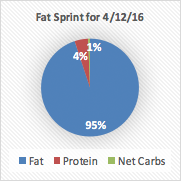 To meet the requirements for the Super High Fat sprint, I averaged 293g fat, 31g protein, and 4g net carbs. 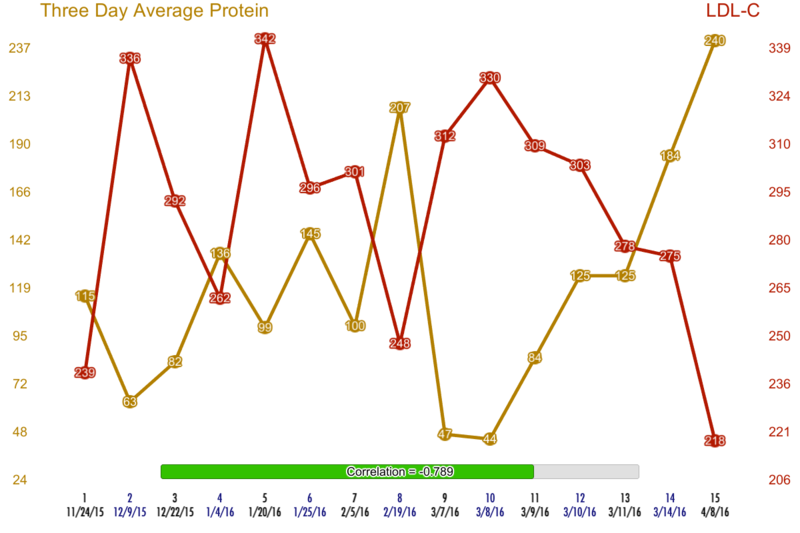 Sure enough, at a preposterously high ratio of fat to protein, my inversion correlation appears to still follow the fat, not the protein. My blood ketone levels (BHB) over these days were 2.1, 2.1, and 1.4 respectively. Then I switched to Super High Protein. 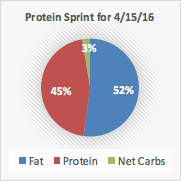 Over these three days I averaged 119g fat, 233g protein, 13g net carbs. I was actually looking forward to this part of the experiment given I’ve always been a big fan of meat. 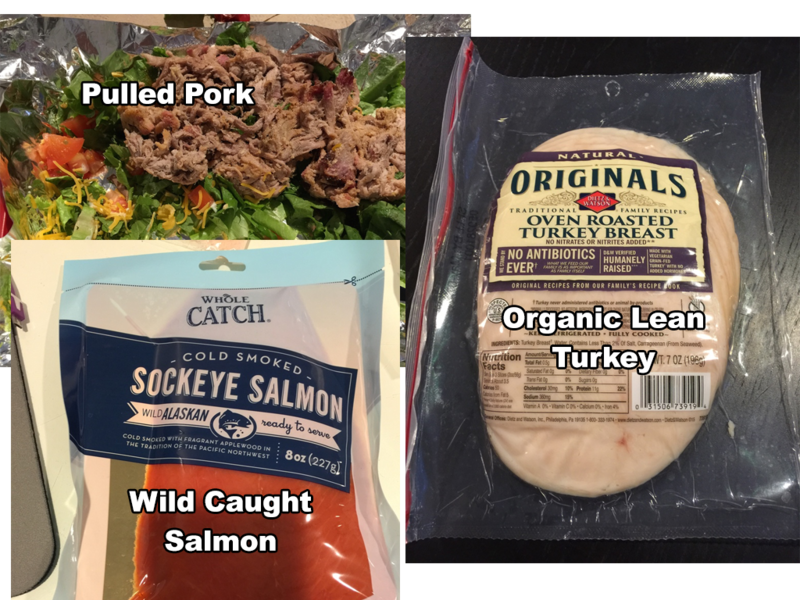 In fact, I wondered if I wouldn’t get hooked on the higher protein ratio due to how much more meat I was allowed to consume. 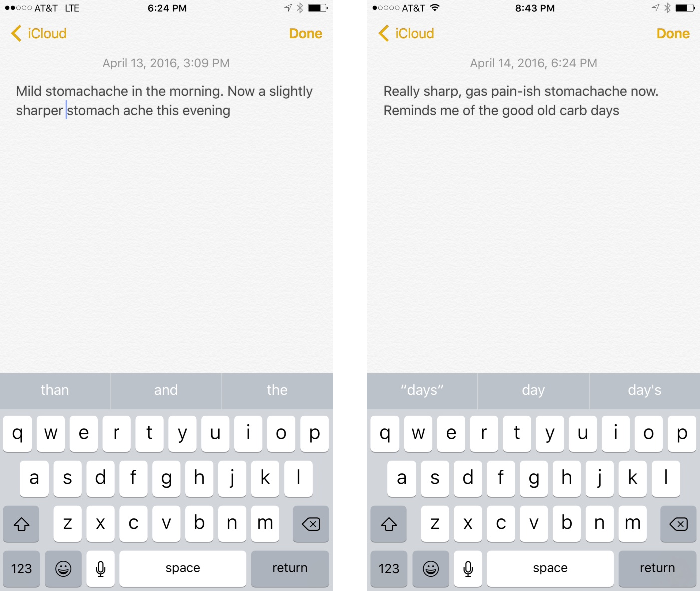 In addition to all this biometric data I collect, I also keep regular notes on any unusual aches, nausea, or pretty much anything I feel that seems out of the ordinary. 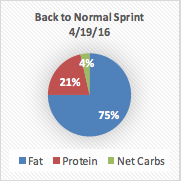 As I was getting to the end of the Super High Protein sprint, it was the only time I felt gastrointestinal distress that I associate with my days before the diet. It was a familiar feeling, but certainly not one I was missing. I likewise felt heavier and less energetic, taking a nap on two of the three days. While I knew I was generating a higher glucose load via Gluconeogenesis due to all the protein, I actually rechecked all my food labels to make sure I didn’t accidentally eat something high in carbs. It’s worth taking a moment to point out two very important observations. First, if my only goal was to reduce my “bad cholesterol,” this would appear as good news. Assuming this trend held, having higher protein and less fat would result in lower LDL-C. As you can see from the graph above, were the inverse correlation holding, the lower 119g of fat would likely push up the LDL-C to around 323 rather than the 263 we see instead. However, the energy level and GI issues I was experiencing were certainly a drawback. It also seemed to fall in line with the second tenet of my theory if it was causing inflammation. See, here’s where the dark side of my theory comes in. What if there are steps I can take which lower my LDL cholesterol but only because it increases inflammation and/or oxidative stress? I might interpret this as a good outcome when it’s happening because, as everyone well knows, lowering dangerous cholesterol is all that matters. Yet what if my body is sending me the correct signals in the first place? 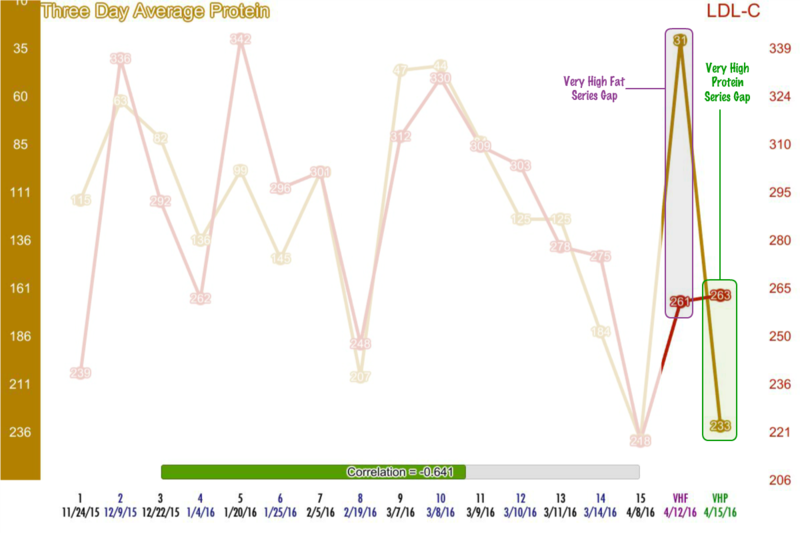 High Carb = feel slower, with occasional GI issues. 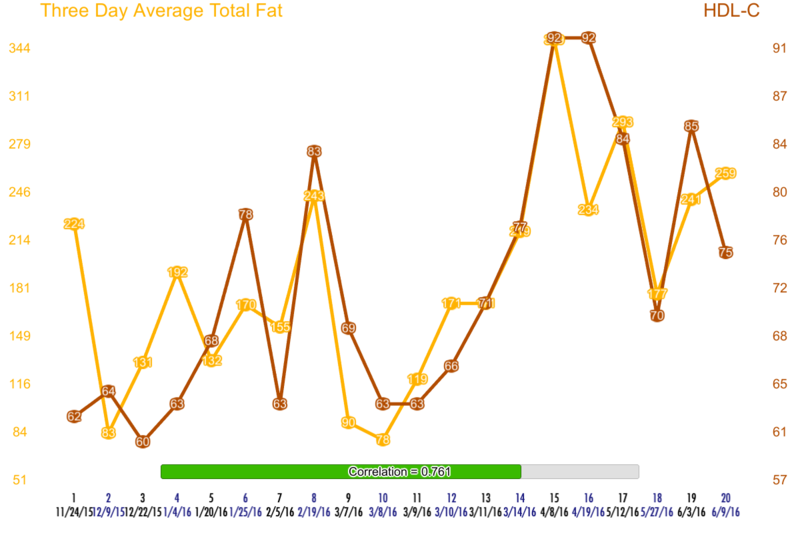 Low Carb, High Fat = feel great with little to no issues. High Protein, Moderate Fat = same as High Carb. I decided to do my final data point to follow the VHF and VHP, which did snap back to the correlation envelope. I then went on the Low Carb Cruise and connected with a few more doctors to discuss the data. After getting back, I did my 19th and 20th NMR with the intent to bring all my data to this blog by the end of May. But I was in for one more twist. The biggest yet, in fact. Yes, data point 18 at the far right shows the largest single divergence in the correlation of any other coupling in this graph. Was it a lab error with my blood? Was it something I ate or drank differently? The only major change I made was cutting out diet soda the week before (primarily Coke Zero). So I first kept to no diet soda for another week and did one more test just to be sure it wasn’t a lab error. The divergence appeared to hold (see below with 19). After that, I went to town with Coke Zero for three days to see if it would spike the correlation to the other side. It seemed outlandish to think aspartame could have kept my cholesterol artificially high, but I had to be sure. Again, the divergence held (see below with 20). This new data suggests my LDL-C has been dropping all on its own (and by extension, Total Cholesterol). But data points 17-20 did not significantly change the correlations of HDL-C, LDL-P, or small LDL-P. In fact, it improved them slightly. HDL-C had a -0.733 before, now it is -0.761. LDL-P had a -0.812 before, now it is -0.845. LDL-P had a -0.726 before, now it is -0.781. 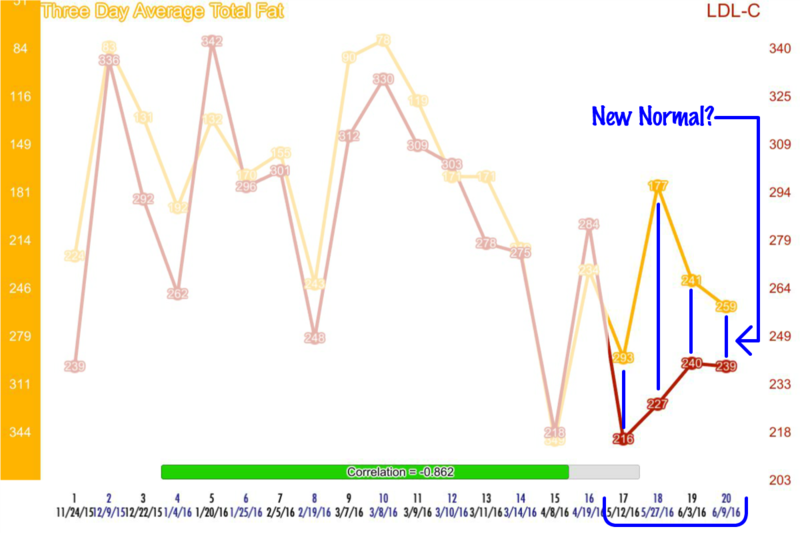 Will data points 1-16 represent a temporary “phase” of my diet with regard to LDL-C, proving 17-20 as the New Normal? Or is it the other way around? Your guess is as good as mine given the 6/9/16 test was the last one I took as of this posting. You hit the protein ceiling pretty hard it seems. Back in cave man days we were happy to give our lean kill to our domesticated wolves & keep the fattier cuts for ourselves. That’s interesting, raphaels7, I hadn’t heard that before. Certainly it was a distinctive feeling I haven’t had in well over a year. Thanks for this Dave, lots to think about, really useful. Glad to hear it. One of my primary reasons for doing this was to gather data for fellow hyper-responders. I am very lean as far as body fat goes. I have been weight stable since starting keto. . I am also very well versed in reading these numbers, so I am not too concerned. but I have yet to come across numbers this high. I wanted to share my data. I test about every three months. So far i have seen an increase in LDL-P and a decrease in trigs. First and foremost, I’ll give you the proper disclaimer — I’m not a doctor and anything I say here does not constitute medical advice — you should check with your doctor on any medical course of action. Your numbers are very fascinating! I’m used to having far higher numbers than everyone else unless they have FH. I likewise haven’t seen numbers as high as yours that are keto-centric. Obviously on the pro-LCHF metrics, the Trig/HDL is stellar and the smLDL at <90 is considered excellent. Conventional lipidologists would likely consider the LDL-P too high (as they would mine). 1) How much / often do you exercise? Given you were referred by Peter, I'm curious if your numbers may be influenced by your exercise regime. 2) What are your macros generally? Are there any unusual foods or supplements that are outside typical keto dieting? Thanks for the reply! I am actually a medical professional and use LCHF in my practice, but thank you for the disclaimer! I’m an RN and a diabetes educator. Id be happy to tell you where to find me on social media. I thought you would be interested in my results! To answer your questions. As far as my exercise. I have been lifting for 4 years. Basically classic body splits with the intent of building lean mass. No cardio except occasional HIIT less than weekly. 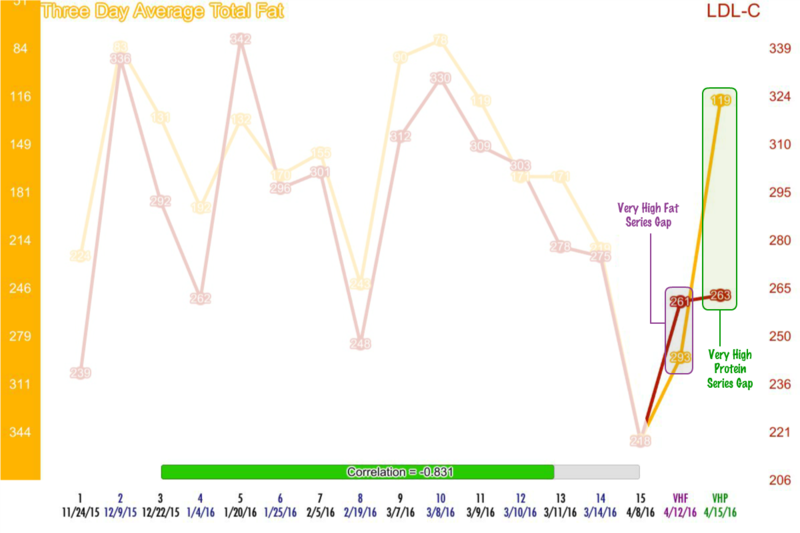 After my first set of lipid results in february I added MAF style running per peters advice since my TRIGs were a little high at 147. They are now 88. I do a slow three mile run about once per week now and still lift 5 days per week. My macros right now are 145/100/10 (f/p/c). 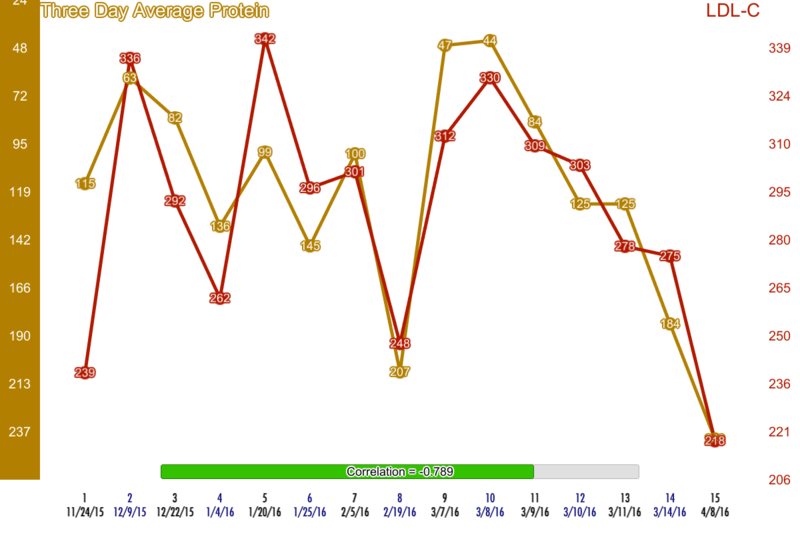 I am actually well above the recommended protein requirement for my weight but still in keto. I test with blood and am usually above 1.2. My weight is around 90 lb. I track and weigh everything i eat. Foods consist of fatty meat (lamb, beef, bison, chicken, venison, fresh salmon, canned sardines/herring, liver, butter, eggs, pork belly, spinach or lettuce, MCT oil, prosciutto, cream, cheeses, pecans, casein powder, coffee, caffeine. I only supplement with electrolytes (mag, na, k). Typical keto with an emphasis on nutrient density. Another odd thing was an INSANELY high b-12 level. 2886pg/ml. Im not sure what to make of that other than it is interesting. Liver enzymes were normal. I am very interested in the significance of high LDL-P when all other markers, as you mentioned, are stellar. 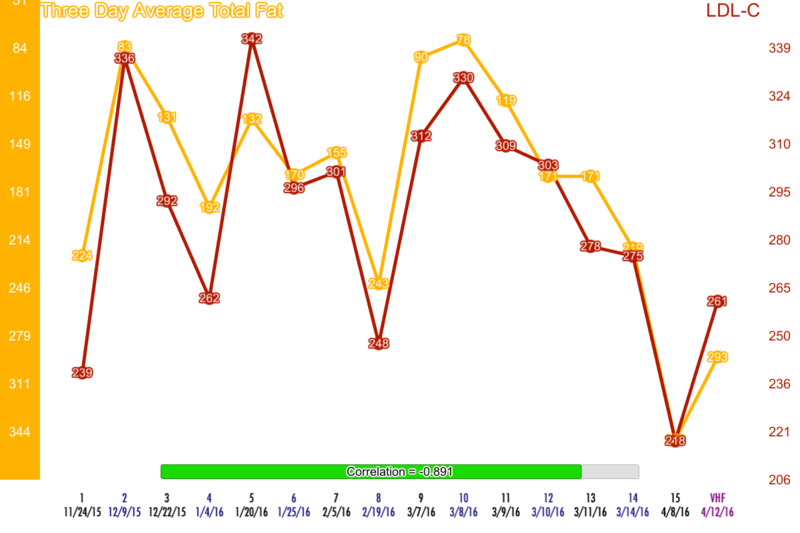 In february, my Lp(a) was less than 1.0. Wow, as a medical professional all your colleagues must be plotting to shoot you with a statin dart gun when you aren’t looking. Yes, I’ll contact your email after this comment regarding some offline questions I have. 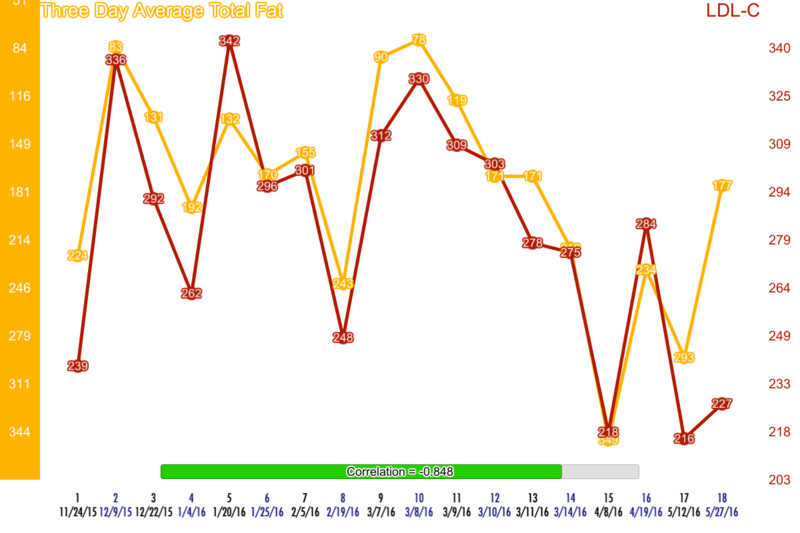 From my own testing, I find trigs to be the most volatile number, which makes sense being fat adapted. 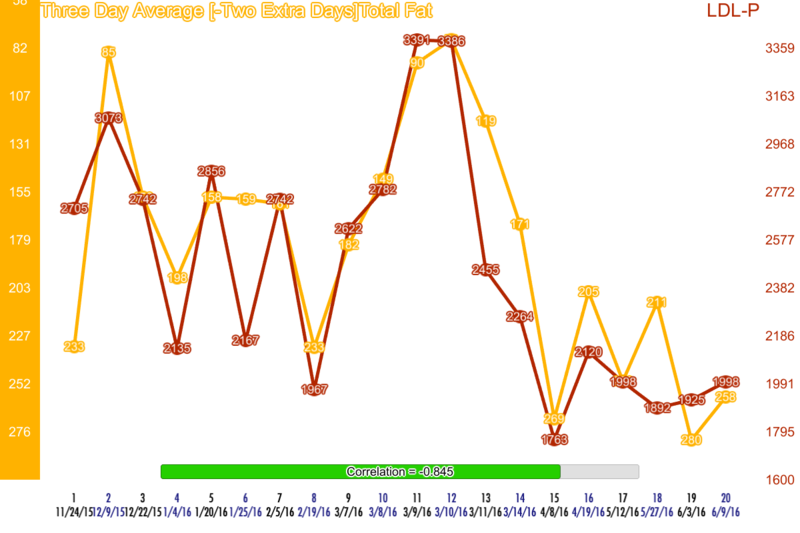 Given more rapid and sporadic fatty acid diffusion/consumption, the distribution consistency in a single blood draw seems likely to vary. I just now changed my supplement profile on advice from Peter’s colleague. I’ll be doing: C, D, K2, Mag, Om3 (via cod liver oil). I prefer not to do many vitamins especially now to prevent confounding variables to my data. Likewise, I have a normal Lp(a) and normal liver enzymes (hsCRP of .53 on last test). Whether we meant to get here or not, we’re pioneers of a new track of data. On one side are low carb professionals who feel pretty confident on the smLDL and Trig/HDL being almost all that matters, with the other side being… well… most of conventional medicine, especially lipidologists. I don’t claim to know for sure if that this path is the lower net risk way to go, but I’m more cautiously optimistic than ever given everything I’ve learned to this point. I have an upcoming post where I will get into the deeper reasons I feel more comfortable with my numbers than when I started. I hope to have it out this week or the next. Even just basic lipids for the fat (macro) – LDL-C inverse relationship. This set of scores is very comparable to mine, you’re likely a hyper-responder as well. My Vitamin D level was 123 ng/ml. 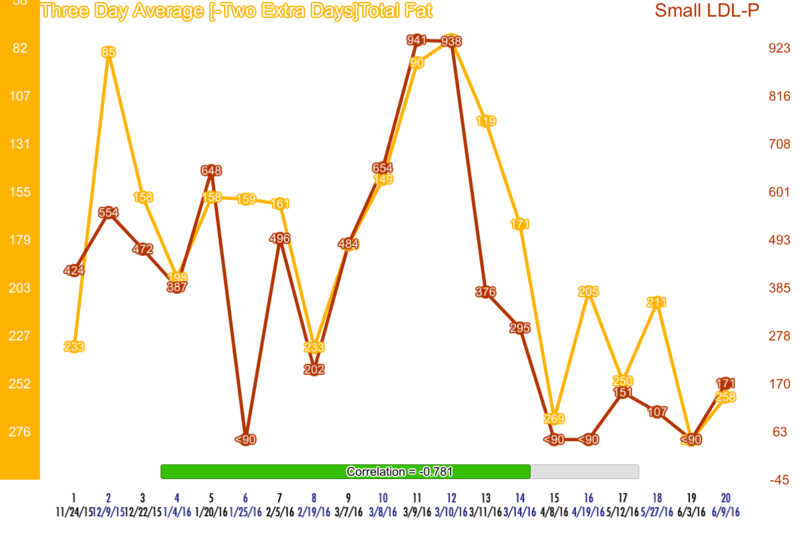 That was from taking about 7,500 units each day on average. Also a journo, so I prefer to provide my data to you via email. I initially connected with you via Twitter about my high numbers. You referred me to your content at CholesterolCode, which I was glad to read. Dr wants me on statins of course. Depends on how I feel, and how much exercise I do. Every now and again I do super high fat for a few days. My high trigs and low HDL are a bit of a concern, but not sure how worried I should be as fit, healthy, and stable weight: 60 kg: 132 lb. I am keen to do your testing protocol and will report back on the results. I haven’t had the genetic testing done but might look into that as well. My kids all have similar numbers so obviously want the best management for them. I am concerned about your higher Trigs and lower HDL given you’re on LCHF. I’d like you to start tracking your food closely. 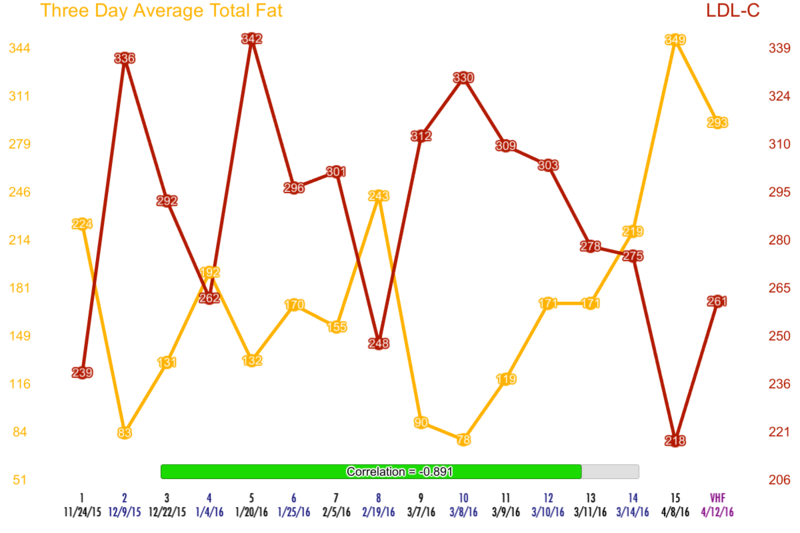 The pattern you’re showing is one I’ve seen with family and friends who have typically been LCHF but turned out to have some “leaks” where they were getting more energy surplus (sometimes carbs, sometimes fat) than they thought. Many different things have turned up such as condiments, drinks, sauces, food mixers like hamburger spices (one packet turned out to be 8g carbs), and even presumed “safe” foods like heavy whipping cream (my dad inadvertently changed to a brand that was 1g carbs per 5ml). It is possible that it is genetic, but less likely given both the TG up and HDL down at the same time. I seem to be a hyper responder. Here are my stats FWIW. I went on LCHF beginning in May 2017. I lost 28 pounds between then and the end of October 2017. Now I am in maintenance. My macros currently are approximately 71g protein/30g carbs/84g fat, but the fat changes depending on my exercise for the day. I do 40 minutes of vigorous aerobics twice a week, 30 minutes of resistance twice a week, and 30 minutes of brisk walking one day per week. The LDL-P number does cause me some anxiety but I cannot find anything empiric that addresses the risks of CVD when LDL-P is high but the particles are large. And of course there is some empiric data showing that LDL-P may be actually be protective when the particles are large — so it will be another cause for anxiety if my LDL-P goes down after my weight has been stable for awhile! Mostly I plan to ignore the whole thing because I feel SO GREAT on the keto diet — I would be miserable if I gave it up. In fact, your lipids look very similar to my own, save your HDL-C is definitely better!